The third volume of Mark Waid’s Daredevil collects issues 11 through 15 of Daredevil volume 3 along with issue 6 of Avenging Spider-Man and issue 10 of the The Punisher volume 8. The Omega Drive continues to be a driving factor, but Waid manages to get other unrelated stories into the comic while still keeping the focus on the Omega Drive. The story flows seamlessly between the three different series without the art or writing changing styles drastically. By the end of the collection, the Omega Drive story arc comes to what I assume is a conclusion for the time being. It comes as a nice bit of a twist as well. My favorite story in this book was unrelated to the primary story arc; as Matt talks to his date about his friendship with Foggy, he recounts his college days. It goes into the details surrounding a professor lying in an attempt to get Foggy expelled, Matt risking his college career to defend Foggy, and Foggy repaying Matt. I’ll withhold the details, but it’s a great story. In the second volume of Mark Waid’s Daredevil, my favorite story was also one unrelated to the main arc of the Omega Drive. The best Daredevil stories seem to be the ones that don’t cross-over with the rest of the Marvel universe. In addition, Waid intends to return Daredevil to the swashbuckler he once was and to take him out of the darkness. I think the dark stories work better. Despite preferring a harsher tone, Waid’s Daredevil continues to be interesting and fun. In the final of this collection, we definitely see some dark things happen to poor Matt again as the story arc changes. This entry was posted in Comics and tagged avenging spider-man, daredevil, mark waid, marvel, marvel comics, matt murdock, spider-man, the omega drive, the punisher on March 30, 2013 by TheUser. Last weekend I ate at one of my favorite restaurants, California Shabu Shabu in Costa Mesa. It’s a fantastic shabu shabu restaurant with great service, fantastic food, and incredible decor. This location features awesome paintings all over their walls along with a cool collection of custom vinyl toys and other toys. I love it. As we approached our seats during this last visit, one of the employees commented that we must be tokidoki fans. Of course we are! We each had a tokidoki shirt, and I was wearing a tokidoki hat. We made a couple more comments and proceeded with our dinner. At the end of our evening as we were leaving, he talked to us again. He mentioned WonderCon, and we spent a minute talking about that. Then he got on the subject of the artist behind tokidoki, Simone Legno. Apparently his girlfriend (or maybe it was his ex-girlfriend) once dated Simone Legno. That’s pretty cool! He mentioned that Simone was a cool guy, but I’m not sure whether they know each other personally or just through mutual friends. Regardless, I thought it was fun to run into someone who knew Simone! This entry was posted in Art, Food, Journal and tagged california shabu shabu, simone legno, tokidoki on March 28, 2013 by TheUser. Scalzi’s eleventh episode of The Human Division has the Conclave and Colonial Union meet in an officially unofficial backchannel discussion. Unfortunately, they’re both attacked. It seems likely that whoever set the attack wanted each side to think it was the other. While they investigate who was behind the attack, they come across some interesting finds aboard the enemy ship. Any episode that features the Conclave is interesting because it’s a different side than that which we normally see. Not only do we get the Conclave in this episode, but we get Conclave interaction with the humans, which is always interesting. While we still don’t know who’s behind the attacks or their motivation, we’re getting closer. Now that the Conclave and Colonial Union each realize that someone is attacking both of them, I expect the tensions to rise. Of course, the fact that there are only two more episodes left in The Human Division make that even more evident! I suspect we’ll get very close if not find out directly who it is and their motivation in the next episode. If only Tuesday could come faster. This entry was posted in Books and Literature and tagged john scalzi, novel, old man's war, review, sci-fi, science fiction, the human division on March 28, 2013 by TheUser. In This Must Be the Place, episode ten of Scalzi’s The Human Division, we get our first look at the human capital of Phoenix. In the Old Man’s War universe, humans are the only species that have used a planet other than their homeworld as their capital. We’ve known about Phoenix since the original novel, Old Man’s War, but This Must Be the Place is the first time we’ve seen it. Hart Schmidt travels home on leave to Phoenix to spend a holiday with his family. We meet his politically powerful father and rich family, and through them, we see Phoenix politics. I love that we get to see so many new aspects of the universe Scalzi has created in The Human Division. The episodic nature of novel allows Scalzi to jump to different areas and show us different perspectives. We’ve been back on Earth, seen Phoenix, and listened to debates within the Conclave. These three episodes have been my favorite of the novel so far. I don’t know where Scalzi will take me next, but I’m looking forward to it. This entry was posted in Books and Literature and tagged john scalzi, novel, old man's war, review, scalzi, the human division on March 22, 2013 by TheUser. If you didn’t watch Improv to the Future tonight, go back in time and watch it! Improv to the Future was an improv show celebrating the Back to the Future movies and hosted by Alex Foster. It was at the STAGEStheater, which I didn’t realize was somewhere I’d been until I got there tonight. As one of the first to enter, I passed the clocks lining the edge of the stage and took a seat in the front row. They were synchronized to each other but not accurate. Eight o’clock came and went, and the show didn’t start as scheduled. Suddenly, Alex Foster ran to the stage, frantically checking the clocks. They were slow! He was late for the show! It was time to start! The show itself was hysterical. I particularly liked the portrayal of a Back to the Future scene set in feudal Japan. My favorite scene of the night was Doc and Marty starring in a 50’s style educational video on the dangers of time travel. If you’ve ever been worried about becoming your own grandfather, this educational video would be perfect for you. If you’re like me you’ll get pretty worked up as you see Doc seductively play the role of your grandmother, but you’re going to have to try to resist as Doc lies back and spreads his legs in the air. Spoilers incoming – the solution is apparently to kill your grandmother and collect your inheritance early. After the show I decided to read about Back to the Future online. Now I feel hyped to rewatch the movies. It’s been years. And then there are those adventure games. The only problem with Thursday night improv is that after an evening full of laughs, I need to get to sleep for work tomorrow. This entry was posted in Comedy, Journal, Shows and tagged alex foster, back to the future, improv, improv to the future, spectacles improv engine, stagestheatre on March 21, 2013 by TheUser. In Scalzi’s ninth episode of The Human Division, The Observers, some Earthling observers come aboard a Colonial Union ship and watch Abumwe handle negotiations with an alien race. Unfortunately, one of the Earthlings dies and it appears to be a murder. If they can’t figure out what happened, it could be bad for the Colonial Union. We’re nearing the end of The Human Division with only four more episodes, and we still don’t know who’s causing all the trouble. However, there’s definitely an overarching plot, and we see it here again. This episode continues the juxtaposition of Earth and the Colonial Union, which is one of the most interesting aspects of the Old Man’s War universe. In addition, we see the continued escalation of the unknown threat. Of course, we still have a number of questions. Who would want to kill one of the Earthlings? Who posed as Earthlings and wanted to blow up the ship previously? Who killed the radio host on Earth? Who tried to set up the CDF to look like the aggressors in the first episode? I’m hoping for some basic answers to these soon so that we have a few episodes full of action. We’ll see what we get tomorrow. This entry was posted in Books and Literature and tagged john scalzi, novel, old man's war, review, scalzi, sci-fi, science fiction, the human division on March 18, 2013 by TheUser. gem and I took archery lessons this weekend! I haven’t used a bow since attending a summer YMCA camp in elementary school, so it had definitely been a while.I was surprised that it wasn’t physically difficult at all, although I guess we had bows for beginners. It was pretty fun! I wasn’t very good, but on the other hand, the sights were a little screwed up. I don’t think I’m ready to buy a bow, but I’d enjoy coming back in the future. 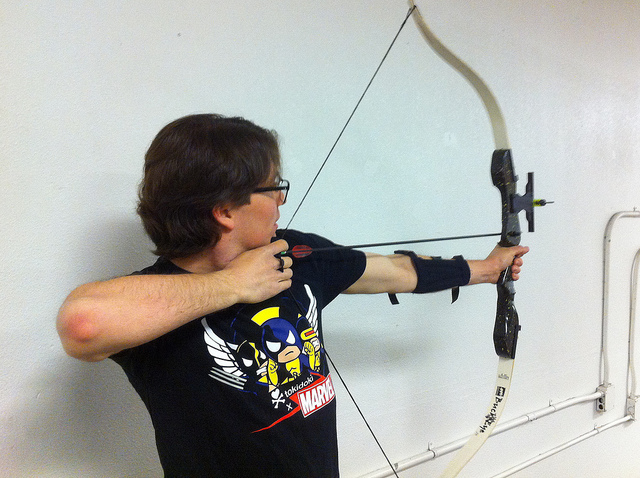 This entry was posted in Journal, Photos and Screenshots and tagged archery, bow, bow and arrow on March 17, 2013 by TheUser.